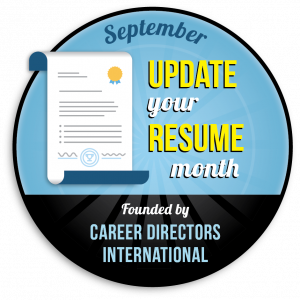 Fourteen years ago CDI registered and launched the international event, Update Your Resume Month (UYRM), to take place each year in September. With summer having come to an end and children back to school, it continues to make sense that adults should take this time for personal career-caretaking. #1 – Decide what you are going to do for the event. Provide special discounts on resume services during the month. Coordinate with a local school, library, bookstore, women’s center, or church to offer a free seminar. Announce a free teleclass or webinar that is open to the public. (Then, of course record it to give as a gift on via your website in the future). Author informative articles and blog posts to be posted on your website or on third-party sites. Create a free e-book that can later be made available for sale. Provide daily tips during the month via favorite social media channel(s). (Later this can be made into an e-book). Whatever choices are made, having something to give provides the professional with leverage to promote and gain publicity. CDI members will find numerous free resources in the member’s section from which to create presentations and information pieces. #2 – Reach out to the media and the public. While members of the media don’t want to hear about a story too early, it’s important not to wait too long. Write a press release about the offering using the time-sensitive link to the upcoming UYRM. Send announcements out to local companies, non-profits, and organizations who might be interested in letting their staff, students, and/or parishioners know. Post signs in community centers. Contact local news agencies – tv producers, radio stations, small local papers, and major newspapers. Add the event to your signature files for email and blog. Spread the word across social media. Professional resume writers can find themselves in a unique position of having clients who work in media, PR, and advertising. Should reaching out seem overwhelming, consider bartering services to have a client target news agencies as the company’s representative. CDI members have access to a wealth of additional resources such as sample letters to professors, announcement press releases, and strategy ideas. #3 – Most importantly, don’t wait; get planning now. The biggest challenge for self-employed resume writers, career coaches, and even academic career counselors is schedule pressure. Wait until the end of August to start planning and chances are any efforts you hope to make will be put on the backburner until 2015. Why wait? With a little strategy now, you can reap rewards for your efforts in September! CDI members can brainstorm and partner with fellow members on these initiatives through 24/7 mastermind communities to canvas more territory and get more done. #4 – Give back, but get back too. While sharing knowledge is fabulous, UYRM also presents a unique opportunity to shed light on the importance of educating the public about professional resume writing. While making a difference with tips, advice, articles, and workshops, remember that this is a unique opportunity to spread the word about the value of hiring a professional. To many out there in the world, professional resume writing is still an unknown. Give advice and spread the word for a future win-win for future profits, future client successes, and future industry visibility.